The 6590i is a small dual-mode GSM phone that operates on the North American frequencies of 850 MHz and 1900 MHz. The phone cannot be used in other parts of the world where 900 MHz and 1800 MHz are used. The phone is identical in size to the older 8390, at least according to Nokia’s US web site. Both phones measure 3.78 inches tall by 1.69 inches wide by 0.75 inches thick. They both tip the scales at 2.9 ounces. Other similarities to the 8390 are also evident, including screen size, backlighting, and overall shape. While I wouldn’t want to bet on it, it’s possible that 8390 faceplates and backplates are exchangeable with the 6590i. Note that there exists both a 6590 and a 6590i. The difference between them lies in the fact that the 6590 is a 1900 MHz-only phone, whereas the 6590i includes 850 MHz as well. I have been told that a 6590 can be flashed with the 6590i firmware, thus indicating that the hardware is probably identical in both phones. I tested firmware version 40.41, which according to the phone’s owner constantly crashes when it detects an 850 MHz signal. Supposedly version 40.44 is supposed to take care of that issue. Suffice it say that I was unable to test the 850 MHz operation of the phone, not that I’d really have been able to anyway, even if I wanted to. The phone has no external indication that 850 MHz is being used, and thus it would never have been possible to know which band I was on. As all of my testing was done using Fido anyway, I was certain that I was always at 1900 MHz. The screen backlighting is provided by bluish-green LEDs, which provide sufficient lighting for the tiny screen. Unlike the 6310i’s bluish-white backlighting, there is no fade-in/fade-out effect, assuming such details are of any interest to you. The keys were very tiny, but even with my medium-sized thumb I couldn’t honestly say that I had any problem with them. I entered quite a few text messages during the test period, and I had nothing to complain about. Unlike the 8390, keys are at least placed in traditional locations. Ringtones are the standard non-polyphonic type that Nokia has been offering since the days of the 61xx series. That isn’t necessarily a bad thing, since the ringer on the 6590i is good and loud, meaning that you’ll have little or no trouble hearing it over noisy environments. Also featured is a built-in FM radio, and all you need to use it is a standard Nokia earbud (though a stereo earbud would be preferable). The radio is probably one of the best I’ve tried in a phone. It blows away the one in the 7210 in terms of RF sensitivity. While it wasn’t exactly a match for the Pioneer tuner in my car, I was surprised at how well it would pull in weak stations, and how much it resisted multipath on local stations. Sound quality and volume are also excellent. Like most current GSM phones, the 6590i also supports GPRS for web browsing, as well as tethered data connections. For use with external computing devices, the 6590i supports both cable and infrared connections. It does not include Bluetooth. I’ve probably said just about everything there is to say about standard Nokia menus and features. 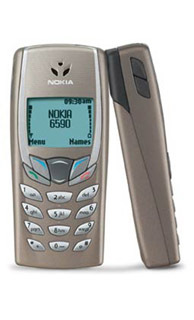 The 6590i has most of the stuff you find on virtually all Nokia’s phones going back to the 7190 (sans the NaviRoller), including their excellent phonebook, calendar, and T9 implementations. I therefore won’t waste any time talking about those features here. If you’ve used a Nokia phone of recent (the Symbian-based ones like the 3650 notwithstanding) then you’ll be right at home with a 6590i. What I was interested in was how well the phone would stack up in the areas that I deem as most important, namely RF performance and audio quality. In both respects the 6590i comes through with flying colors, though there was a gotcha that needs to be mentioned. Tonal balance and earpiece volume on the 6590i are both very good, though when the volume boost feature kicks in (when loud background noises are present) the phone seems to suffer from a marked amount of sibilance. During non-boosted tests, the overall sound quality and balance was very good. I hesitate to say it was excellent, since to my ears the phone sounded a tad tinny compared to other phones on the market, such as the Nokia 6310i or the Motorola P280. Unless you’ve used such phones, its unlikely you’ll notice. I was also able to test the phone using a standard Nokia earbud, and it worked exceptionally well with that. It produced globs of volume, and the overall sound quality and tonal balance of the earbud was as good as any other earbud I’ve ever tested. Like many small Nokia phones, it uses Nokia’s proprietary 4-pin 2.5 mm jack. Although standard 3-pin plugs fit, they don’t work. The phone’s owner also lent me a full Nokia car kit for the 6590i, and I wasn’t very impressed with that. However, I believe the problem lie with the kit and not with the phone. Since I’m not reviewing the car kit here, we’ll leave it at that. Outgoing sound quality was excellent, and the phone managed to sound just as good as anything else I’ve ever tested. Even in the presence of extreme background noise (such as in an old pickup truck travelling at 110 km/h with the windows down) the user’s voice was still very discernable over that noise. Maximum earpiece volume fell a bit short of the 6310i, which so far is the loudest phone I’ve tested, especially when the volume boost is in effect. That aside though, the 6590i is louder than most phones presently on the market, and it should produce more than enough volume to make it useful under any noisy conditions you might encounter. RF performance is terrific. I went to every weak signal area I could find in Square One, and I tested it against my 6310i. The 6590i matched it almost to the inch, and its overall reaction to weak signals was also superb. It’s ability to hold on to service while idling was also exemplary, and even in extremely weak areas the phone would ring while sitting in my shirt pocket. For small phones like this, shirt-pocket performance is very important. Network recovery speed was amazingly fast for a Nokia model. In countless tests I observed the network return within less than 30 to 45 seconds. This isn't quite as quick as a Motorola phone set to Continuous Network Scan, but it's damned close. But what about that gotcha I mentioned earlier? This comes in the form of transmitter buzz, which is at least as noticeable on the 6590i as it was on my old 6190. This is a pulsating buzz sound that is actually caused by interference to the audio circuits by the transmitter. It is most noticeable when signals are weak, since the transmitter has to operate at full power under those conditions. It drove me nuts years ago on the 6190, and it drove me nuts just recently on the 6590i. How it affects you depends on your personal tolerance level for this sort of thing. So in conclusion, if you’re looking for a compact GSM phone with good RF performance, good audio quality, high ringer volume, a solid time-proven menu design, and a built-in FM receiver, you can hardly go wrong with the 6590i. No, it doesn’t have polyphonic ringers, a color screen, Bluetooth, J2ME (Java) support, or a built-in camera, but if those features aren’t important to you, I think you’ll be very happy with the 6590i.